People who live in the country tend to view “gophers” in much the same way city people view rats. Suffice it to say, neither animal is particularly popular. Much of the time, when farmers, gardeners, or groundskeepers are complaining about “gophers”, the animal in question is actually a ground squirrel – and around here it’s usually a thirteen-lined ground squirrel. Although they are beautiful little animals, thirteen-lined ground squirrels have run afowl of humans because their preferred natural habitat of short-cropped grassland is very similar to that found in many yards, baseball diamonds, gardens, and crop fields. When ground squirrels move into those human-built habitats, their burrowing and feeding behavior tends to get them in trouble. Thirteen-lined ground squirrels are very attractive animals – unless they’re eating your garden plants or digging holes in your landscaping. 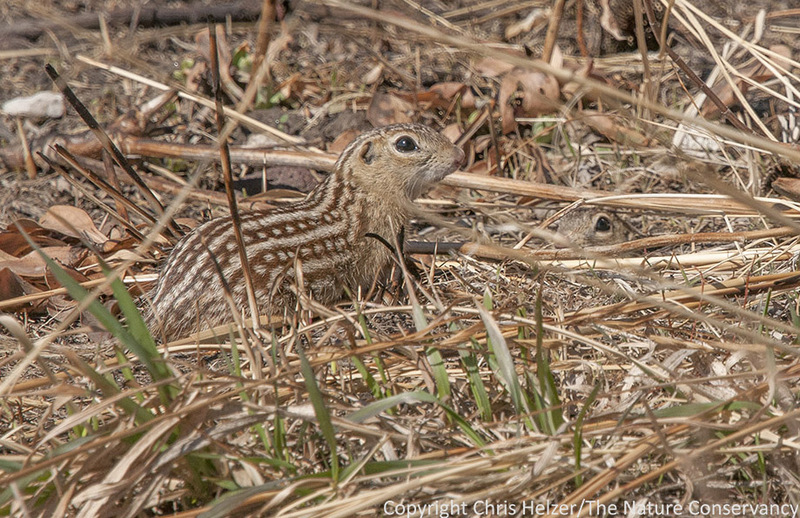 There are actually two ground squirrels in this photo – can you find the second one? Click on the photo to see a larger and sharper version of it. Thirteen-lined ground squirrels (Ictidomys tridecemlineatus – formerly Spermophilus tridecemlineatus) are found throughout much of central North America. They are 5-7 inches in length, not counting their 4-6 inch tail. Their name comes from the combination of light and dark stripes that run lengthwise along their body. The lines of spots within the darker stripes are particularly striking. Thirteen-liners have a high-pitched call – among others – that sounds much like a bird. In fact, it took me several years to figure that out. I know my grassland bird calls very well, but couldn’t for the life of me figure out what bird species kept calling but never flushing as I moved in to investigate. I finally realized it wasn’t a bird at all, which made me feel both embarrassed for being so badly wrong and satisfied that I wasn’t woefully ignorant of some common bird call. There are several kinds of burrows made by thirteen-lined ground squirrels, each with its own purpose. Nesting burrows can be 15-20 feet long, with multiple entrances. Hiding burrows are usually scattered around nearby to provide a quick escape, but those burrows are typically very short and have only one entrance. During the winter, the ground squirrels hibernate in burrows that extend below the frost line and the entrance is plugged up until the ground thaws enough in the spring that the hungry inhabitant can burrow back out again. In all cases, thirteen-lined ground squirrels disguise the entrances of their burrows by scattering the excavated soil away from the hole itself. Ground squirrels are themselves well camouflaged, and help disguise their burrows as well, by spreading soil out away from entrances. Thirteen-lined ground squirrels eat seeds throughout the year, but favor them most in the fall as they prepare for hibernation. During the spring and summer, they consume green leaves, fruits, and flowers from many plants, but are also fairly significant predators, feeding on worms and insects (especially caterpillars, beetle larvae, and grasshoppers) as well as small vertebrates. In fact, grassland bird studies have shown thirteen-lined ground squirrels to be a very significant predator of both eggs and young birds in some prairie landscapes. In my part of the world (east-central Nebraska), there are two species of ground squirrels, which are differentiated by both habitat preference and coloration. While thirteen-lined ground squirrels have distinctive striping and prefer to live in very short vegetation, Franklin’s ground squirrels are found in tall grass and are unstriped. Franklin’s ground squirrels are rarely seen, but we spot enough of them in our Platte River Prairies to assume they must be fairly common here. I’d like to know much more about their habits and needs because they are a species of conservation concern – especially in more eastern tallgrass prairie regions. While Franklin’s ground squirrels are fairly uncommon in many places and difficult to find when they do occur, thirteen-lined ground squirrels are very common and abundant – much to the chagrin of those people who find themselves at odds with them. Thirteen-liners enjoy the more intensively grazed portions of our prairies, and seem able to find new patches of grazed prairie as we change the location of that habitat type through time. I’ve often wondered whether an individual ground squirrel actually relocates each year to keep up with those shifting patches of short-cropped prairie, or if populations just increase (and/or become more visible!) where our grazing is most intensive each year. Ground squirrels are important prey for many of the larger predators in our prairies, including hawks, coyotes, snakes, and badgers. In fact, their popularity as badger food can compound the hassles associated with having thirteen-lined ground squirrels living in cultivated or landscaped places. In our own prairie seed nursery, ground squirrels enjoy living and running around in the plots and mowed trails between them – and we can (mostly) live with whatever damage they cause. However, the giant holes created by badgers digging ground squirrels out of their little burrows are a lot harder to ignore. This entry was posted in Prairie Animals, Prairie Natural History, Prairie Photography, Uncategorized and tagged gopher, ground squirrel, ictidomys tridecemlineatus, mammal, nebraska, platte river prairies, prairie, spermophilus, thirteen-lined ground squirrel by Chris Helzer. Bookmark the permalink. Do all those holes in the ground moderate temperature extremes? For example, warm air rising out of the burrows in spring and fall. One burrow might not make a difference, but one burrow every couple of square yards would add up. Here is something else interesting “The Physical Ecology of Vertebrates: A View From Energetics,” pp. 256, 8.8.4 Adaptions to burrow atmospheres. These “darn gophers” make burrows which help oxygenate the soil resulting in a benefit to plants. Maybe these ground squirrels are more helpful than anyone had ever considered. Since badgers seem to be becoming less common, I wonder whether you can get a sense of their population in your prairies based on their excavations. I have badgers on my prairie, but haven’t seen or heard any 13 liners. However, I have lots of voles and mice so I assume that is what they are targeting. A good question. I would guess there’d be a relationship between hunting burrow density and badger numbers, but don’t know enough about the subject to answer that. Yes, badgers can eat lots of different kinds of small mammals. Your grass might be a bit too tall for thirteen-lined ground squirrels. Maybe if you mowed it every week…? There is a good population of Franklin Ground squirrels at the Henry Dorley Zoo in Omaha. They are a wild population but can be found picking up scraps of food from the snack bar. I would like to see if the Franklin reintroduced to a tall grass prairie away from the zoo. Nice post Chris! I am familiar with two WI studies that show thirteen lined ground squirrels are a significant predator of grassland bird eggs and the primary prey species of our badger. I personally am always happy to see them show up at our restoration sites. One more cog in the web of life and all the little holes they make are great microhabitat for other critters. I’ll trade my Pocket Gophers 1:2 for Thirteen Lined ! I had one last year with a hole under my tomatoes. He/she was sharing them with me. One of the neighbors cats got him. Darn Cats!!!!! Here in Mid-Michigan, Thirteen-line ground squirrels are frequent residents of cemeteries and parks (our version of short grass prairie). Last summer we had one excavating in the lawn of our USDA office building. I got a lot of strange looks from people coming into the building when I was laying in the lawn on my belly with a camera waiting for it to pop its head out of its burrow. It’s even funnier when you’re lying on a wooded riverbank, photographing flowers, and a bunch of drunken college students going down the (flooded) river on inner tubes yell to ask if YOU are okay – as opposed to the group of impaired people floating on inner tubes in a river at flood stage. Here at the UW Madison Arboretum native plant garden, the 13-lined ground squirrel burrows soon become nesting sites for bumble bees. So far, we’ve found B. bimaculatus, B. auricomus and B. impatiens nesting in old ground squirrel and chipmunk burrows. Thanks, Susan – that’s great! I would think ground squirrels would make perfect bumble bee nest sites. 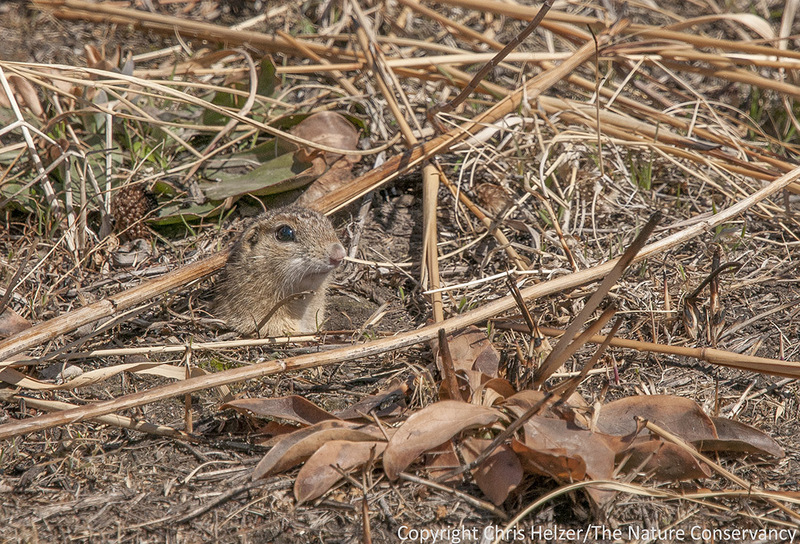 I wonder if they prefer the nesting vs. hiding vs. hibernating burrows…? We’re do these ground sqirrels go I use to feed them all the time with our food then I don’t see them anymore ,did they leave? And never going to come back? are they gone forever and will new ones arrive? I don’t know. They tend to be pretty good at reproducing as long as they have good habitat. They like shorter vegetation structure, so if that habitat has changed, that might explain it. Otherwise, it’s hard to know if a disease hit them or a predator found them. I wouldn’t give up hope. I work for Battelle Darby Parks in Columbus, Ohio. We have restored prairies and some bison.I am currently investigating re-introducing the thirteen -lined ground squirrel to our bison area. I have been unable to find any information about introducing the ground squirrel besides general information. Any information or advice regarding this would be appreciated. Would you consider gophers to have the same ecological benefits to prairies and soil as prairie dogs?